O’Connell earned his BS degree from the University of Oregon in 1966 and his MFA in 1972, studying fine art with David Foster. “Dave told me I should number and date my sketchbooks,” says O’Connell, “which I thought was kind of funny.” He took his mentor’s advice, however, and five decades later he is working on Sketchbook 72. (He has them all except number 70, left on a train from Conwy, Wales, to Manchester, England.) He served in the Navy and taught elsewhere for several years before joining the UO faculty in 1978, remaining with the University full time until his retirement in 2002. He taught drawing, painting, ceramics, photography, filmmaking, and animation, always with a focus on visual thinking, and as art department head for thirteen years, he helped bring the department into the digital age. Although he always had his students keep sketchbooks, the format didn’t emerge as the focal point of his courses until 1999, when he proposed a sketchbook workshop to Randall Koch, director of the Sitka Center for Art and Ecology near Lincoln City and a former student. (“As my late professor David Foster told me,” says O’Connell, “‘Be kind to your students, they may offer you a job.’”) The workshop filled instantly, as did the next, and the next. 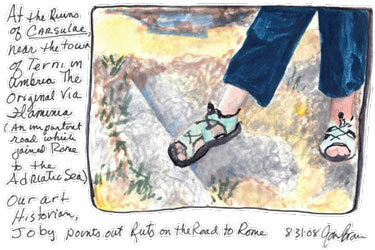 The Oregon Coast was all well and good for sketching, but some of his students, most of them older adults with the time and inclination to travel, were clamoring for a trip to Italy. 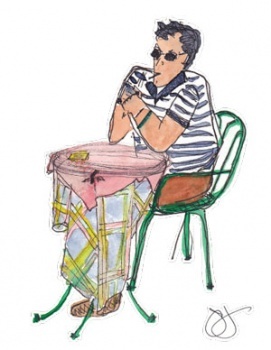 Another former student, Lucy Hart ’62, told O’Connell of a school in Umbria where her sister, Lisa Hart Guthrie ’57, had taught for a decade, and in 2006 O’Connell led his first sketchbook workshop in Italy. This summer he will lead his fifth. “I was standing in line at Trader Joe’s, and the woman in front of me [Harrison] was showing the cashier a sketchbook, telling her she’d just been on this sketching trip to Italy,” recalls Jan Brown, an artist and graphic designer. “I asked who the teacher was, and when she said it was Ken O’Connell I was very interested. He had been my instructor at the UO in the late 1970s; he was wonderful!” Brown signed up for O’Connell’s next sketchbook trip to Italy, in 2008. “We sketched our brains out!” she says. Unlike many of O’Connell’s adult students, Brown has been an artist all her life, but still finds the experience of sketching critical to her practice. “I sketch wherever I happen to be,” she says. She sees this as one of the greatest benefits of sketching—“For people who are caught up in their own thoughts, sketching is like a meditation. It’s a mind-expanding experience that way. 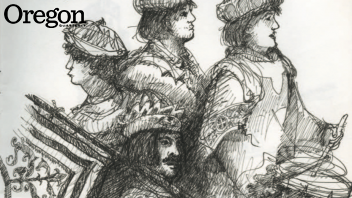 When you’re sketching, you have to be present in the moment.” Brown and Harrison are both members of the Top Drawers, a group formed in 2006 following O’Connell’s first adult sketchbook workshop in Umbria. Wanting to continue developing the work and the friendships the trip had launched, several students in the Eugene area continued meeting regularly to sketch, attend art events, and support one another as artists. You can see work by Brown, Harrison, and the other Top Drawers online at www.topdrawers.org, and in the exhibition Top Drawers on Tour, on view August 1–31 at the Emerald Art Center in downtown Springfield.